Florentine Quiche with feta cheese and summer sausage. I for the most part do not partake in the habit of eating breakfast or lunch, as I am like a snake. I consume most of the time, one main meal a day which is dinner. Breakfast and lunch as a rule for me is just a cup of coffee. DH and MIL graze all day, plus they eat three main meals a day. So with this said, occasionally we all go out to one of the local diners that New Jersey is famous for, for brunch. When that happens, then I don’t eat lunch or dinner. I love Belgian waffles with butter and maple syrup; deep-fried French toast with butter and sugar; Florentine omelets; cream chipped beef; two Philadelphia influenced foods: scrapple with maple syrup and last but not least porkroll on a croissant with cheddar cheese. 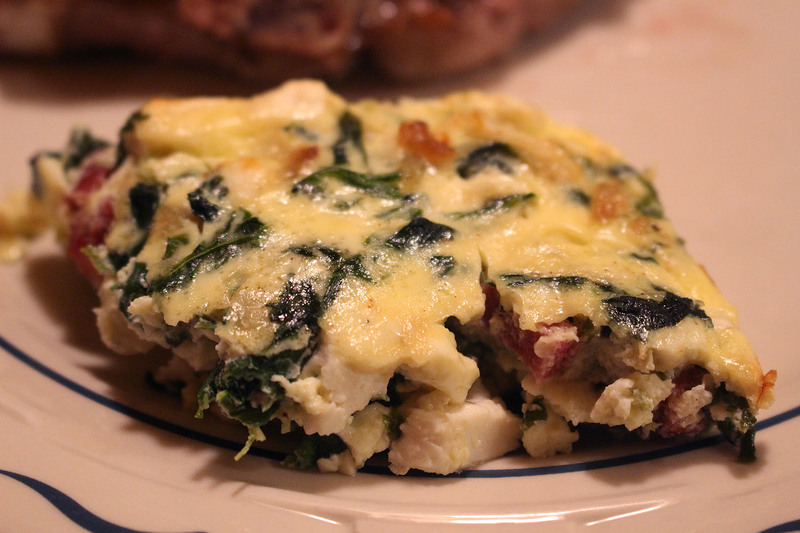 This Quiche below is a play on the Florentine omelets. And then microwave them for 2 more minutes. Add one tablespoon butter to skillet on medium heat. Saute onions for 15 minutes stirring enough that they don’t burn. Squeeze excess water out of spinach, and rough chop it. Place spinach and summer sausage in with the onions and saute for 3 minutes. Use remaining butter to grease a 8″ pie plate or 5″x 8″ shallow baking dish. In a mixing bowl add eggs, milk, cream, and nutmeg and whisk until a uniform color. Mix cheese, spinach and sausage in to egg mixture.